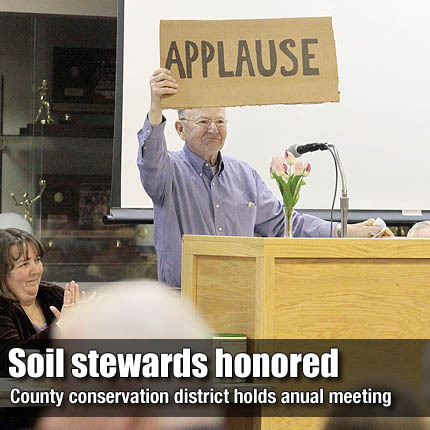 Ron Fredrickson makes a subtle gesture for applause while delivering nominations for the election of supervisors Monday at the Osage County Conservation District annual meeting at the Osage City High School. Wayne Litch, Melvern, and Sue Thompson, Quenemo, were nominated and elected by voters at the meeting. Youth poster, essay and limerick contest winners appear on Page 3A. Additional photos from the meeting are available at ochc.zenfolio.com.